My name is Cherry St. Croix. Society would claim that I am a well-heeled miss with an unfortunate familial reputation. They've no idea of the truth of it. In my secret world, I hunt down vagrants, thieves . . . and now, a murderer. For a monster stalks London's streets, leaving a trail of mystery and murder below the fog. Eager for coin to fuel my infatuations, I must decide where my attentions will turn: to my daylight world, where my scientific mind sets me apart from respectable Society, or to the compelling domain of London below. Each has a man who has claimed my time as his--for good or for ill. Though as the corpses pile, and the treacherous waters of Society gossip churn, I am learning that each also has its dangers. One choice will see me cast from polite company . . . the other might just see me dead. Cherry St. Croix is anything but sweetness and light, but that is the last thing that she wants the uppercrust of London society to know. In fact, she would be happy if they knew nothing of her at all given the way that she has been labeled "the daughter of a madman" due to the exploits of her long dead scientist father. The last of which, resulted in the death of himself and her mother. It seems that unlike the murder who has been leaving a trail of body parts all over London, the gentry are unwilling to let dead things lie. Neither for that matter can Cherry; not when there is a bounty for the killer and some coin for her purse. You see, Cherry St. Croix is a "collector" and in a time where women are to be seen and not heard...satin and lace. She dares to speak her mind and her corset is steel. 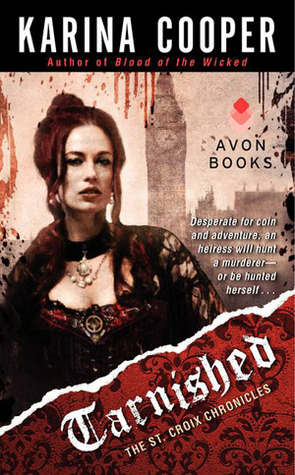 Tarnished is a book that is sure to call to the free-spirited reader who loves characters that rail against convention and dare to be more when cautioned that less is best. Cherry St. Croix, unlikely lady by day, turned bounty-hunter by night, fits the bill in spades. She is already a woman on society's fringes and she is by mo means afraid to push the envelope. As if Cherry's public duality isn't enough, there are also the ever present demons of drug abuse and the ghosts of her tragic past which haunt our heroine relentlessly. The real adventure of the story begins to unfold in earnest when Cherry delivers a bounty that she is never paid for and her boss denies ever having received. 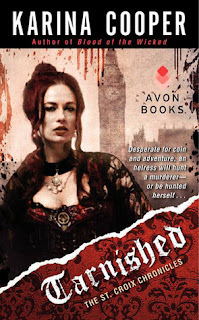 It is while on the trail of her missing bounty that her readers and Cherry explore the seedier side of Victorian London; a world full of drugs, murder, and intrigue that the questioning mind of our bounty hunting beauty is loathe to let rest. The winding road of intrigue has more than a few surprises for Miss St.Croix, some of which, if she is not careful could prove deadly. This is a very fast-paced read that never gives readers a chance to get bored. The story is so engrossing that readers can't help being drawn in to the dark recesses of London's underbelly as well as the pomp and circumstance that surround the "social elite". Can Cherry continue to walk the line between the yin and yang of her world? What mysteries lie ahead for her? I can't wait to read the next book in what promises to be a great series.